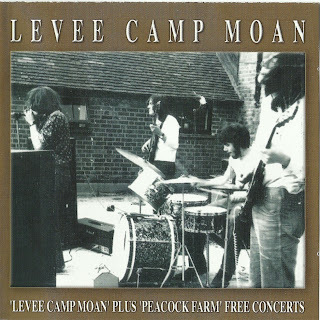 Levee Camp Moan's self-tilled LP, released in 1969 on the County Recording Service label (SVVS 132), is without a shadow of doubt one of the UK s rarest and most prestigious private pressings to emerge out of Britain's thriving underground blues scene of the late 60's. In fact this extraordinary platter, albeit housed in a rather drab looking custom-built, heavy-duty cardboard sleeve complete with a pasted on snap of the group, is now so scarce that only those prepared lo part with four-figure sums are ever likely to stand a chance of securing a copy. Interest in this recording has been long standing. 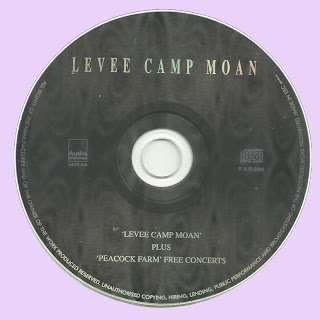 In 1993 Audio Archives reissued the album on CD tor the first time, including, into the bargain, two live tracks that were taken from another Levee Camp Moan related album called 'Peacock Farm'. (Which is another story, but one we will turn to shortly). Taking their name from the old blues number. Le Camp Moan were formed in the late 60's when the five members, manager and assorted roadies took up the residence in a country farmhouse on the Bracknell Delta. The name of this sprawling farmstead was Peacock Farm. It was here that Levee Camp Moan were able to leave their equipment permanently set up and. Being relatively isolated, the band could rehearse as often, and as loudly, as they liked without fear of disturbing anyone. In this rural setting, the teenage blues-rocker-, sel about honing their gritty renditions of blues standards that encompassed influences from the urban blues of Otis Rush. Buddy Guy & Junior Wells together with Muddy Waters and Skip James. The more or less contemporary white blues of the time. Canned Heat. Savoy Brown and Paul Buttcrfield etc. also provided a great source of inspiration. From their Berkshire roots the band quickly built up a following on the British Blues Circuit, frequenting the likes of the Marquee. Crawdaddy, Klooks Kleek. Eel Pie Island and Rikki Tik clubs. On the college circuit they toured extensively with Chickenshack. Canned Heat and Muddy Waters with performances being of sufficient appeal and merit so as lo attract record company interest. Sadly all ensuing proposed deals never got off the ground resulting in the band having to rely on themselves alone if they wanted to make a record. And so it was in early "69 that ihey entered Virgin Sound in Windsor to lay down eight tracks, recorded on a four track machine, for Ilieir debut album. At the time of its creation the term private pressing would have had little or no relevance in music circles and would have offered little insight into the nature of the project. As already outlined, the LP, as perceived by today's standards, was every bit the archetypal private pressing. Unrefined and. moreover, free from record company interference, the band were able to retain thrillingly raw edge making sure that Levee Camp Moan remained a primitive yet vital effort full aggression and spirit. Very few copies of 'Peacock Farm' appear to have survived and oven less with the cartoon insert that was meant to be stapled into the middle of the gatefold sleeve One has to remember that, in the main, both LPs were available only to local audiences which greatly contributed to their scarcity. Collectors should also be aware that 'Peacock Farm' is not a second LP by Levee Camp Moan as incorrectly stated in various rare record books and articles, but a 'various artists' LP featuring Levee Camp Moan, amongst others. This record was aptly labelled 'Live Recordings made at Peacock Farm Concerts' and was issued by Bracknell's County Recording Services COUN LP 158/9). More importantly, the missing disc did actually make it to the acetate stage although how many were cut it’s anybody's guess probably just a handful. Amazingly Levee Camp Moan kept performing, albeit intermittently, until 1975 long after singer Frank Woodward had left leavin Sal Bristow to front the outfit. Despite other material having been recorded, the whereabouts of which is unknown, what we are left today are 2 desperately rare LPs that nobody has a realistic chance of obtaining and, now. this updated CD of our second release from close to a decade ago. Interestingly some of the members of LCM have in the music scene to this day. Leader Ian Campbell carried on performing with, amongst others. Nashville Teens, Arthur Brown's band and Mungo Jerry and released several albums in the 80's with his own outfit, the Ian Campbell Blues band. Drunmmer Malcolm Ashmore continued to pick up the sticks for various pub Blues bands whilst bassist David Stubbs played with a host of others including gigs in Eric Clapton's band and lengthy world tours with Uli John Roth (ex Scorpions). Frank Woodward sadly died in 1987 and Sal Bristow retired from the music business upon the band's demise. Just checked both formats, didn't noticed the kind of problem you mentioned, apart from the password mistake which was fixed. Spounds great, Marios! Thx for sharing. Many thanks for this rare share. I went to the same school as Ian Campbell – he was a legend! A sixth former with a real band, a real LP and an outstandingly good guitarist. i have the peacock farm comp lp(coun lp 158) which came with cover a cover of sorts, printed inner sleeve with newspaper reviews of the event and tracklist/ credits.. also have the acetate for it, seems to be the same songs as the lp but I haven't really played it much as its got white patches growing over it! seems to be a part 2 to county 158 ?